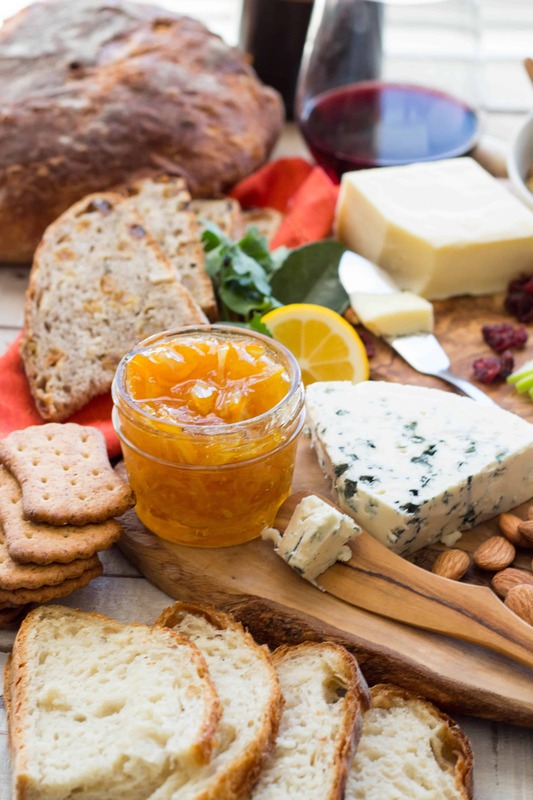 This post is all about how to easily create an impressive cheese board for entertaining, along with an easy recipe for Meyer Lemon Marmalade. If you like to entertain, there are a few things you should know how to do, and how to do them well. For instance, you should know how to mix a really great cocktail, know how to set the mood with the perfect playlist and you absolutely, hands down need to know how to create an over-the-top, show-stopping cheese board. And this Meyer Lemon Marmalade? Definitely a must. Anytime I host a gathering at my home, I like to put out a massive display with lots of little picky things for my friends to nosh on. There’s always something for everyone, and it invites people to gather around, chat, sip and savor. Today I’ve joined forces with Castello Cheese to create a tutorial on how to put together a killer cheese board to impress your friends, whether its two or 20. Cheese is the star here, so do everyone a favor and don’t skimp. You should always have a selection of a few different cheeses that vary in texture, age and flavor. A good number to start with is 3, but depending on your number of guests and any other food you’re serving, you can opt for six, seven, eight or even more different kinds. When selecting your cheeses, consider their age, texture, type of milk, country of origin and overall flavor profile. Be sure to choose cheeses that are all fairly different so that they contrast from one another. Think about having at least one hard, aged cheese like parmesan or aged gouda, and at least one soft, creamy cheese like brie or goat cheese. You also want to have something mild like Manchego or creamy havarti in addition to something more bold and full flavored like a blue. For this board, I selected Castello aged havarti for its sharp, caramelly notes, as well as Castello creamy havarti for its buttery flavor and melt-in-your-mouth texture. Along with those two, I added rich, tangy Castello creamy Danish blue to round out the trio. Castello offers a variety of creatively crafted cheeses that will help take your board to the next level! When it comes to presenting your cheese, you can leave soft spreadable cheeses whole with a cheese knife, and opt to slice, cube or crumble the others. Because many cheeses look similar in appearance, it’s helpful to cut each one into a different shape in order to distinguish them on the platter. 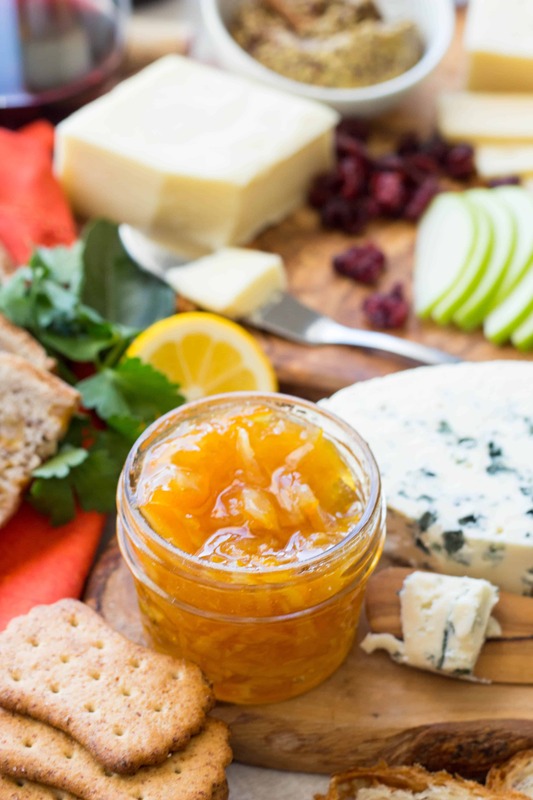 Without accompaniments, a cheese board is simply just a plate of cheese and I think the Meyer lemon Marmalade I made for this board is perfect! 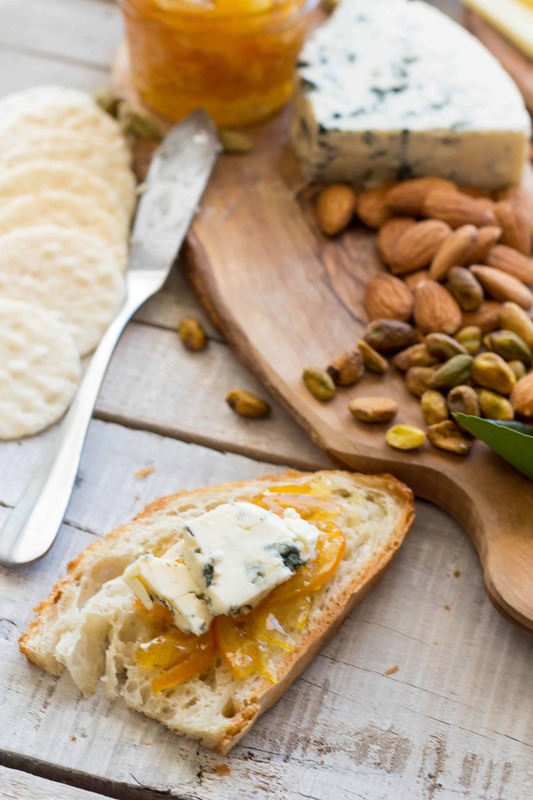 Think about the individual cheeses you’re serving, and come up with some select pairings for each. 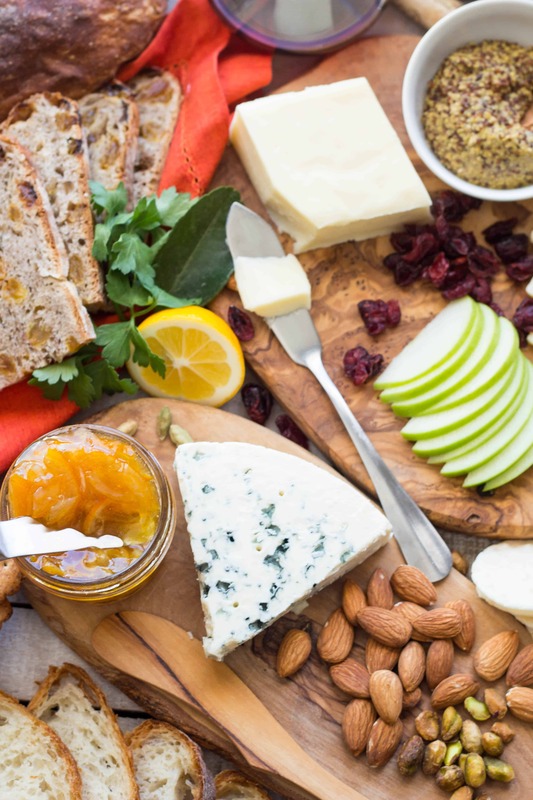 Whole grain, spicy and sweet mustards are great for cutting through the buttery richness of mild cheeses, while different honeys and fruit preserves are fantastic foils for tangy, full flavored cheeses. You can always keep it easy by purchasing good quality accompaniments at the store, but I like to go the extra mile and make at least one thing from scratch. For this board, I used freshly harvested Meyer lemons from my tree to create a sweet and tangy Meyer lemon marmalade. I infused it with a bit of cardamom to bring out the fragrant, floral notes of the lemons, a genius pairing I discovered last year when I made this tart. I loved this Meyer lemon Marmalade with all three cheeses, but I found it worked best with the tangy, creamy Danish blue. 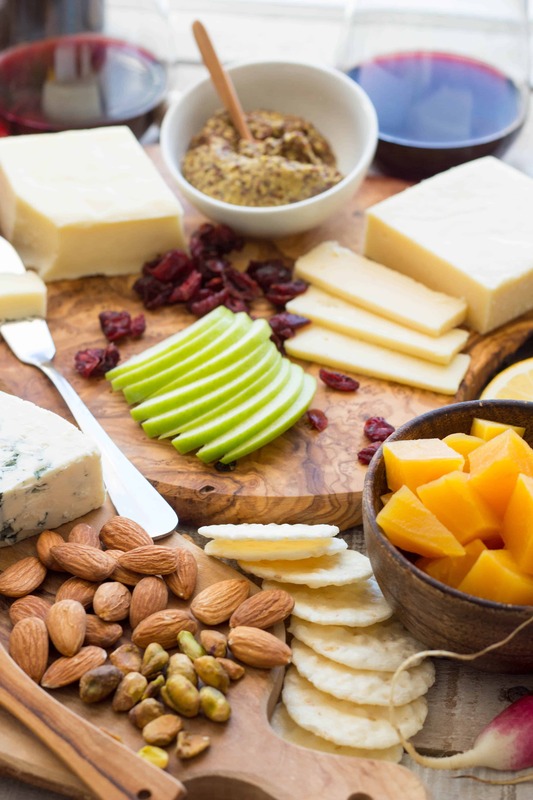 In addition, a cheese plate should always have some fresh and/or dried fruit and a few handfuls of nuts. Not only do these provide great flavor and textural contrast to the cheeses, they really make the platter look great. I used some thinly sliced green apple and dried cranberries this time, but grapes, pears, persimmons, dried apricots, figs, cherries and dates are all great choices, too. You can opt for a spiced or candied nut mix, or keep them plain like the whole almonds and pistachios I used. Just be sure to toast them a bit first to bring out all their beautiful, nutty flavor. Sure the Meyer lemon marmalade is enough, but to me, there’s no such thing as too much “stuff” on a cheese board. The more little nibbles there are to pick at, the better. It keeps it visually appealing, and makes sure everyone has something they like – even those who (gasp!) don’t eat cheese. I always like to include some good quality olives or some sort of raw, marinated or pickled vegetables, like the pickled golden beets I used here. Cured meats are great for adding more substance to the platter, especially if you don’t plan on serving a ton of other food. It’s important to always offer something starchy to act as a vehicle for the cheese. I put out a selection of different crackers and breads, with at least one gluten free option if applicable to the crowd. I used some whole wheat crackers, gluten free rice crackers, a cranberry raisin bread and rustic Italian bread. Don’t forget to put out a small pair of tongs, cheese knives, little spoons, a stack of cocktail napkins, some toothpicks, and a little bowl for stashing used toothpicks and olive pits. When it comes to selecting the surface for where you’ll create your display, make sure it’s flat, neutral in color and don’t be afraid to think outside of the box. A simple black or white platter is nice, but try to choose one that doesn’t have raised or tapered edges. I love the look of a mason jar, which is what I used to hold the Meyer lemon marmalade. I find cheese boards are easiest to arrange and look best on a surface that’s totally flat. Wooden cutting boards, pieces of slate, marble slabs, even picture frames and mirrors are all fun and interesting ways to set the stage for your artful display. Just be sure the surface is food safe and hasn’t been treated with any toxic paints or chemicals. Here, I used a few smaller, organically shaped wooden boards on top of a white washed palette to create an inviting, rustic look. When arranging your cheese board, it’s nice to include some greenery and garnishes to make it come alive. You can never go wrong with fresh herbs; they always look good and smell amazing. Other options to consider are leaves from citrus plants, grape vines or fig trees. Pop into your local florist and ask if they have anything available to sell you on the cheap – just be sure to confirm they’re food safe and haven’t been treated or sprayed with anything toxic. Okay, so this technically isn’t part of the platter itself, but if you’re putting all this effort into designing an epic cheese board, you had best have some wine to go along with it. 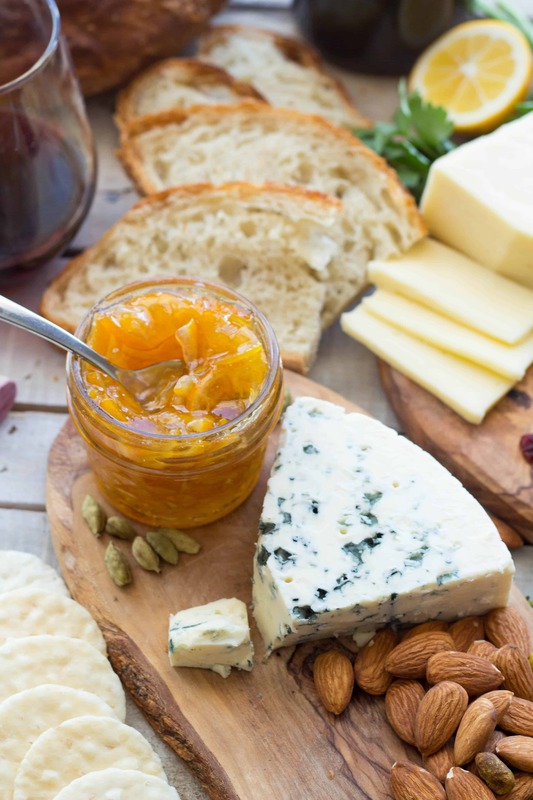 Think about the time of year, the types of cheeses you’re serving, the accompaniments (like the Meyer lemon marmalade!) and of course the preferences of your crowd. It’s always best to offer an option of both white and red, although I find more people choose white in the summer and red in the winter. In the summer, I like to serve crisp, chilled wines like dry rosé and sauvignon blanc, in addition to light bodied reds like pinot noir and bubbly lambrusco. In the winter, I stick to big, tannic reds like cabernet sauvignon and Bordeaux blends, and full bodied white wines like chardonnay. For this soiree I served two great wines by Folie à Deux; A buttery, rich unoaked chardonnay and a fruity, slightly spicy zinfandel. Both wines paired beautifully with the selection of creamy, complex Castello cheese. Whenever I plan a spread, I always choose a theme or find a source of inspiration to help make my decision making a little easier. My inspiration for this particular board was the golden hues and high fashion of award season, as evidenced by the gorgeous gold hue of that Meyer lemon marmalade! If you know me, you probably know I’m far from a movie buff. I mean, I kind of fell asleep during Star Wars… In 3D… at IMAX. (Chill, you guys, I was tired!) I love watching award shows solely for the fashion. I can’t get enough of the red carpet, and I plan on hosting an Oscar party just to see what everyone’s wearing. And for the cheese… And the wine, obviously. 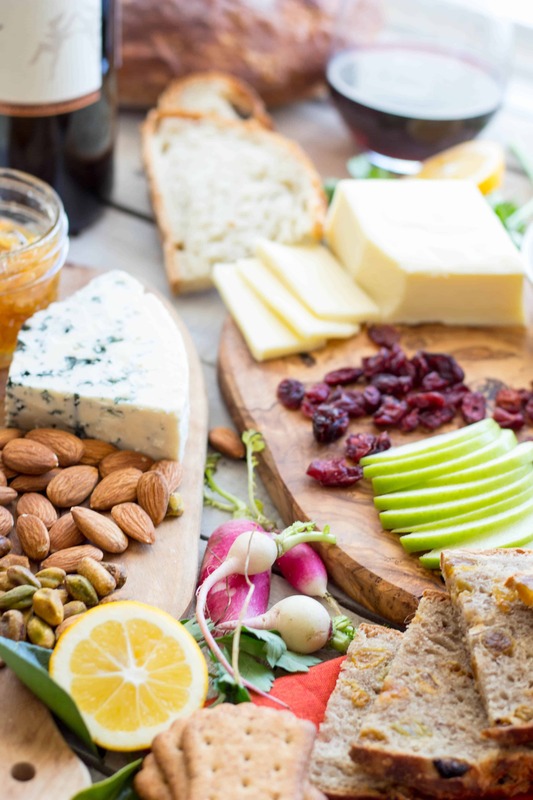 If you’re planning to put together an amazing cheese board like this for your own Oscar party or any other event, Castello wants to give you a little inspiration by sending you to Napa Valley, California! Enter the sweepstake here! Thank you To Castello Cheese for sponsoring this post! All opinions are my own. Check out their video below to learn how to make yet another great cheese accompaniment, this Sweet and Spicy Carrot Chutney. And for another awesome Castello Havarti recipe, try out my Caraway Havarti + Pear Crostata. Don’t forget to scroll down a little more to get the recipe for that luscious Meyer lemon marmalade – great on a cheese platter or your morning toast. This easy recipe for Meyer Lemon Marmalade is sweet and tangy with a hint of cardamom to bring out the floral Meyer lemon flavor. Wash the Meyer lemons well. then slice each one in half lengthwise. Use your knife to remove the inner white pith that runs down the center, the use your fingers to scoop out any seeds. Reserve the seeds, then cut each half in half again lengthwise. Use a very sharp knife to cut each lemon quarter into very thin slices – make them as thin as you possibly can. Add the lemons to a medium saucepan along with the sugar, water and salt. Take the reserved lemon seeds and lightly crushed green cardamom pods, place them in a small piece of cheesecloth, and tie it with a piece of kitchen twine. Add it to the pot, and bring it up to a boil. The lemon seeds are high in pectin, which will help to set the marmalade. Reduce the heat to a simmer and cook for about 20 minutes, until the lemons break down and the liquid reduces quite a bit. It should be thick and syrupy. Allow the mixture to cool. 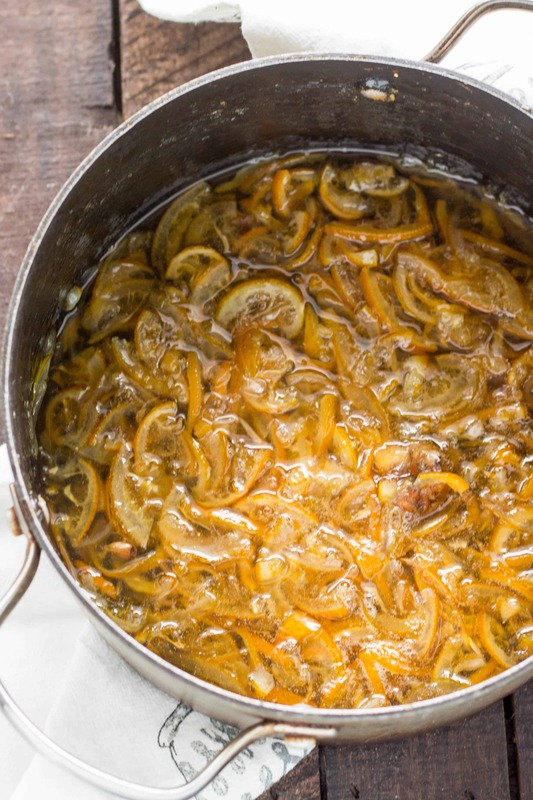 Remove the lemon seeds and cardamom pods, then transfer the marmalade to a jar (or jars). Cover and keep refrigerated for up to 1 month. Oh, my fingers are so crossed for you to win that trip, too! Napa is so amazing. I learned about the lemon seed trick a few years ago when I was making a plum jam. Still no idea if it actually makes a difference, but it can’t hurt, right? I’m not all that jam savvy. Would love to try a calamondin one of these days! You have such amazing fruits growing in your backyard! Wait just a cotton-pickin’ minute…. YOU have a Meyer Lemon tree??? Do you keep it in your house? I have so many questions about that now! The cheeses are BEAUTIFUL!!! Your presentation looks fabulous and the suggestions on display are really helpful, Coley. I DO have a suggestion, though. The closeups are great, but I really would liked to have seen the Full Monty (so to speak).. just to get an idea of how much space you used with all the different cheeses and condiments and greenery. Maybe next time? Please? LOVE ALL of your posts, babe! Also… thanks to Castello for the sponsor and sweepstakes… how fun is that!?! Hi there, I’m sorry to just be getting back to you, but yes, i think that you palrbboy got an overripe cheese. That’s too bad, and well worth talking to the store about. If they’re good cheesemongers, I’d think they would reimburse you in $ or in a fresher cheese. You’re right that cheese is spendy: good cheese takes milk from responsibly raised cows, the skills of an experienced cheesemaker, and time, so I look at artisanal cheese, big or small as a an occasional treat that supports a lot of good people. You’re right though that you can often get a great deal on cheeses cut from larger wheels my fave local cheesemonger has a basket of cheese ends that’s a wonderful resource.